On November 5th, 2009, Dr. Is-haq Akintola addressed a full auditorium on the topic of pluralistic democracy in the Islamic world. 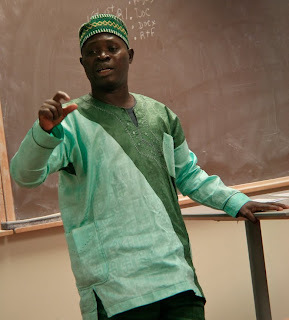 This lecture, which was a sponsored by the social and behavioral sciences department, was the last of Akintola's many talks he has given over the past three weeks he has been at Gordon College. In his lecture, Akintola said that although extortion and crookedness in Nigeria has become widespread, Muslims believe there will be good government. "The people will not live in fear. The purpose of democracy is good government. Muslims believe that is coming," Akintola said. Along those same lines, he discussed the level of laziness and corruption in Nigeria, using a humorous anecdote of choosing one's hell to make his point. Although, Akintola said that this lack of work ethic does not manifest itself in Muslims. "Islamic democracy injects a dose of discipline into the people that are leaders," Akintola said. Akintola also spent time discussing the purpose of democracy and its original intent to maintain order. He also addressed the limitations of democracy and the differences between Western and Islamic democracy. Akintola said that when it comes to American democracy, Muslims are accepting but uninterested in converting to it. "Muslims accept and respect Western democracy, but would rather keep their own form because it is based on the supremacy of Allah. Muslims see Western democracy as dry and lacking of divine involvement," said Akintola. Islamic democracy is based on involvement of God and many of the laws come from the Qur'an which establishes Muslims beliefs in fundamental human rights. Akintola reinforced to his audience the fact that the Qur'an also does not promote violence. "I salute the Muslims that have stood firm in the face of irrational extremists. We know very well that these messages could not have come from minds that are healthy and well-informed by the teachings of Islam," Akintola said. He went on to say that he personally condemns terrorism and that force alone cannot bring peace to the world. Akintola acknowledged the United States' role in bringing peace to the world, as well. "The West must open its doors and address sensitive policies. The world is watching America. The world is watching President Obama who promised change-- he is giving many, many people hope," said Akintola. "The United States must stand for peace and justice."